We’ve all seen those pre-movie public service announcements where The Muppets, a dancing bag of popcorn or some other movie character informs us to kindly turn off our electronic devices before the show starts. It’s common decency to do so. But when The Little Mermaid Second Screen Live hits theaters next week, Disney is asking you to do the exact opposite: If you go, bring an iPad to the theater to use during the movie. The film itself is a re-release of the 1989 classic. But since many of the children and parents attending the movie have already seen it, Disney has introduced a second screen feature into the mix to hold your kids' interest in the most high-tech way possible. 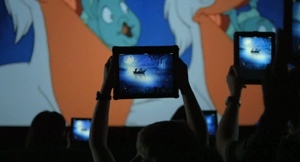 “By simply downloading the free ‘Second Screen Live: The Little Mermaid App’ to an Apple iPad or iPad mini and bringing their Mermaid-loaded devices to participating theaters, fans and families can interact with the film, play games, find hidden treasure, sing along, and compete with the audience for the chance to win great prizes,” the company explains. Second Screen Live: The Little Mermaid App is currently available for download for iPad or iPad mini; be sure you install it before heading to the theater. To obtain tickets to the show, visit your local box office or use an advance ticket purchasing service like Fandango.